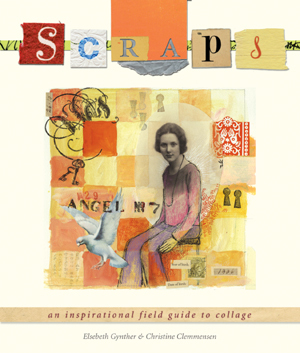 The new book “Scraps” from Lark Publishing is subtitled “an inspirational field guide to collage” and that’s exactly what it is. It’s the perfect book about collage for beginners but also a great book for more experienced collage artist who maybe need a little jump start or inspiration. It’s filled with page after page of terrific samples and covers topics like collecting ideas, getting started, finding your inner artist, working with photos, tips on image transfer and inks, a nice glue guide, cutting tips, fixing mistakes or saving a collage you’re not happy with and many more. It also has a nice section about stamping, including how to carve your own simple stamps. The part I liked best were the sections on composition. One thing that seems to intimidate most people about collage is how to lay everything out in a nice pleasing way without looking like you just threw a bunch of papers and objects on a canvas. This book gives you many different “layouts” and tips for putting together a balanced composition and adding focal points. Here’s a collage of mine that reminded me a bit of one in the book, it uses stamping, vintage papers, textile, found objects and the central motif composition mentioned in the book. “Scraps” is available here from Lark Books. 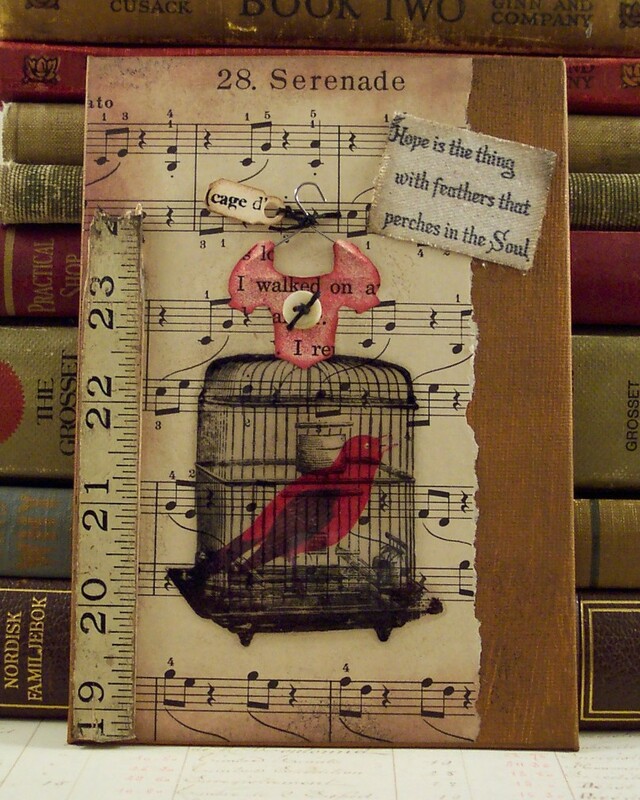 Looks for another Lark book review and a giveaway coming soon here on the stamping blog!